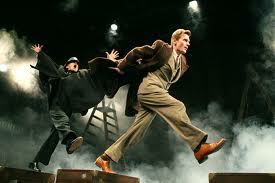 The 39 Steps…British and Brilliant! 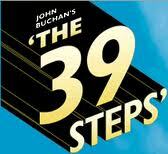 Last night I popped down to The Criterion in Piccadilly Circus to see The 39 Steps. 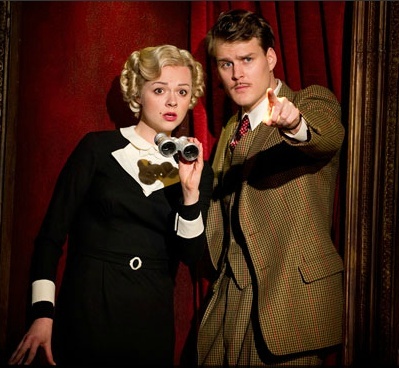 I read the book several years ago and then saw the Hitchcock film (with its amended ending) so I was looking forward to seeing how this tale of murder and mystery translated not only on to the stage but also into a comedy as well. 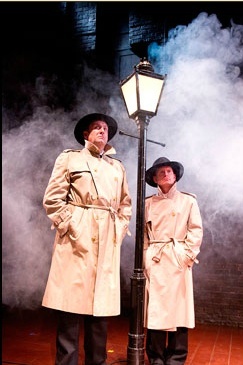 The play follows the Hitchcock movie plot pretty faithfully and there’s a clever mix of effects, movement and acting which allows for the transition of each stage of Richard Hannay’s thrilling and fast-moving tale. The show is billed as 4 actors playing 130 characters over 100 minutes. The three female roles – the predatory Annabella Schmidt, the innocent Margaret and the ‘do-right’ Pamela – are played by Catherine Bailey. These are necessary roles in the story and Catherine does a great job with all of them. But this play, by its very nature, throws its male characters into the limelight. Andrew Alexander plays Hannay with manic, John Cleese-ian fervour moving from privileged languor to adolescent awkwardness to splendidly British stoicism as Hannay evades the law, the criminal and any costume changes. So it is indeed 4 actors playing 130 characters over 100 minutes. It is also inordinately clever and brilliantly funny. If you are in London and fancy anything from a giggle to a guffaw, make sure you catch this. This entry was posted in All the World's a Stage, Expat moments, laugh out loud, Life in the UK, London Love and tagged Life in the UK, The 39 Steps by Kym Hamer. Bookmark the permalink.